About a month ago I attended an educational event hosted by a district in Downer’s Grove, IL. The event, Playdatedg58, encouraged attendees to learn, create, and collaborate with other teachers in the area. I was able to attend many sessions, but missed one of the sessions called Math Literacy. Fortunately, I was able to find a Prezi that was created for the presentation after I returned from the trip. After reviewing the presentation I started to think of how I could incorporate more math dialogue in my classroom. I believe that students need to be able to talk through their mathematical thinking and be able to communicate this with others. There’s no doubt that language arts/reading plays a significant role in just about every subject area. For math, students need to be able to read directions carefully, understand context, understand if an answer is reasonable, and use vocabulary appropriately. These are all important skills to have and can be reinforced through math literature. Most of these tasks generally fall in the realm of language arts/reading. Moreover, these skills will help students develop skills that will benefit them long-term. So I’ve decided to incorporate more literature in my math classrooms this year. Specifically, I’m using more literature during my guided math group stations. Generally, students end up spending about 10 – 12 minutes per station, so you can infer that the reading is fairly short. There are about 4-5 students at each station so the comfy math literature station isn’t busy with shuffling papers. The small group also gives students opportunities to choose a book on their own without too much interference. 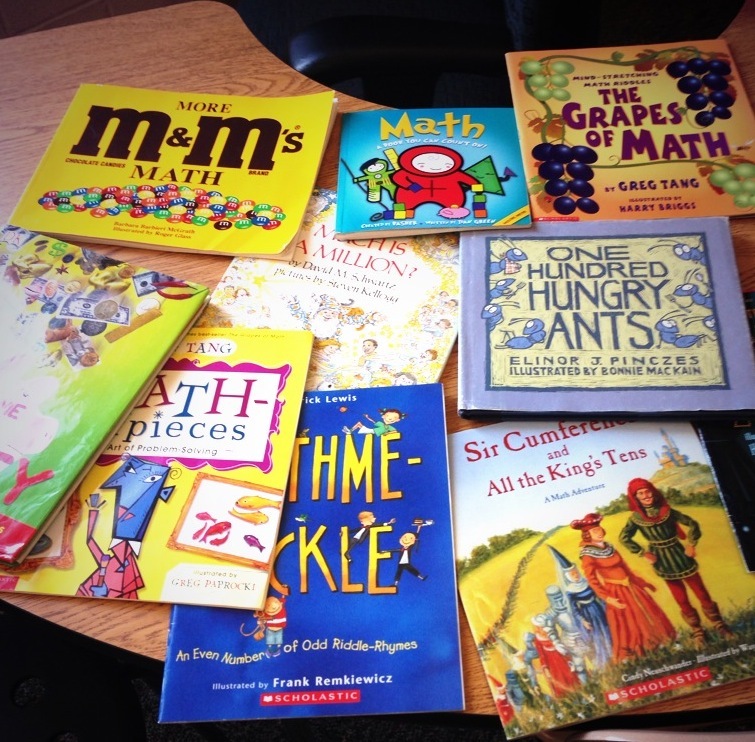 The books that I’m using are primarily for elementary students and emphasize the number sense math strand. Number sense seems to be the strand of mathematics that needs an enormous amount of support, especially at the younger elementary level. The books generally emphasize taking apart and putting numbers back together. Place value and computation are two consistent areas of focus for younger elementary students. Below you will find a picture of the math books that I’m using during math stations. Click the picture to enlarge and see titles/authors. While in the groups, students answer questions related to the book that they’re reading. Some of the questions are generic while others are more book specific. Depending on my inventory, (which I hope to increase substantially) most of the books that I use are vocabulary rich and provide critical thinking opportunities. Some of the books offer number puzzles where students can check their answers in the back of the book. Each student completes a “math think sheet” which records what book was read, the pages read, math vocabulary, and concepts covered. Students keep track of their time in the station and write as they read. In the future I may have the students work in partners and read the books together. The class could then have a math book chat and record all the books that we’ve read throughout the year. These are starter ideas, but I’m definitely encouraged when I see disciplinary lines blend as students observe that math and literature are connected. ‹ PreviousGuided Math: What About the Other Groups? I really like the idea of the math literature station but have always been a little concerned about student accountability and ensuring that the work is thoughtful. Would you be willing to share a sample “math think sheet”? I have similar concerns and tend to wonder if the groups are working to their potential. I uploaded an editable Word document and it’s up in the post above. Thanks for the comment. This is great. Thanks for sharing an idea and resource that I can build on for my 5th grade class. I added “and use context clues to define them in your own words” to the vocabulary word section and am mulling over some sort of concept connection – “How does this connect to something you already know?” Is this something you have tried or considered? You bring up some valid points that I didn’t initially consider. I’m thinking that the definition idea has potential. I like the idea of having students create their own definition. Having a class conversation afterwards and creating a class consensus definition may be a powerful activity. You can then reference the words/definitions as the year progresses.